From the terrace of Place Ville Marie in the downtown core of city of Montreal in Quebec, Canada, one can enjoy the view of Avenue McGill College where people spend their time shopping. 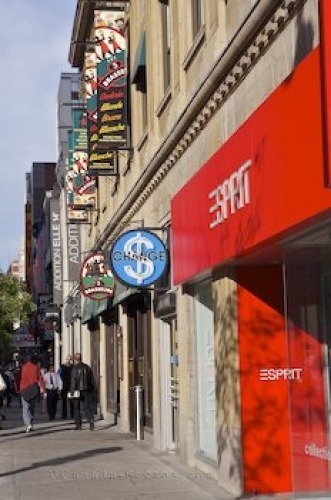 This street was named for McGill University and was widened in the 1980's. Major construction took place and Avenue McGill College was redone to create a scenic area in downtown Montreal, spanning four blocks in length. Picture of the people shopping along Avenue McGill College in downtown Montreal in Quebec. At night, the traffic slows down along Avenue McGill College and the buildings become illuminated in the glow of the night lights. Looking north on Avenue McGill College from the terrace of Place Ville Marie, downtown Montreal, Quebec, Canada.